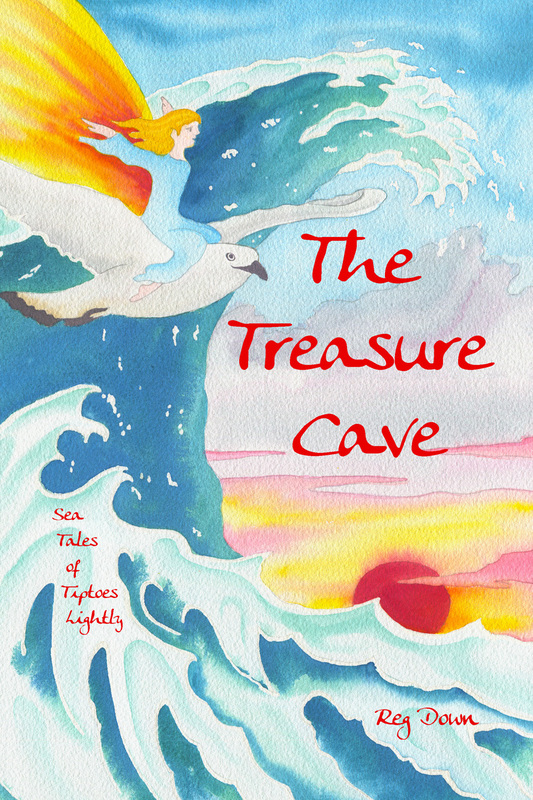 A synopsis of The Treasure Cave: sea tales of Tiptoes Lightly by Reg Down. Includes age suitability, reviews, cover design and a link to sample chapters and stories. Tiptoes Lightly loves the sea, and when Farmer John and his children, Tom Nutcracker and June Berry, drive to the seaside for Thanksgiving she goes along with them. Tom and June discover a freshly uncovered cave in the bluffs that run along the shore. They call it their Treasure Cave just for fun, but then find seven beautiful pearls and a finely wrought golden chain buried in the sand. Tiptoes sets out to find the story behind the pearls, and soon a delicate web of tales begins to unfold. Stretching back to the creation of the world, they weave together until Tiptoes and the children are caught up in the ongoing drama between the Sea King and his lovely daughter. This book is older in tone than the other Tiptoes Lightly books, and while it is still intended for family reading, it is more suited to grade 1 through grade 4 children. Sample chapters: Chapter 1, Chapter 7, Chapter 8, Chapter 14, Peter and the Sea Maiden (in the original, concentrated form).